You must have heard about the famous Baltit Fort of Hunza but how much do you really know about this architectural monument of historic importance? Let’s explore. We recently visited the Baltit Fort and we have compiled a list of 5 interesting facts that might not know about the historic monument. The foundations of Baltit Fort were first laid some 700 years ago. Over the next couple of centuries, restoration work was carried out. The biggest one took place in the 16th century when artisans from Baltistan came to Hunza and changed the entire shape of the fort. The Ladakhi/Tibetan architecture influence of the fort comes from the same restoration period. This restoration work by Balti artisans was done as part of a dowry of a princess who got married to a prince of Hunza at that time. Baltit Fort was not the only home to the family of Mirs – the royal rulers of Hunza. The royal family was based out of an even older Altit Fort which is located in the village of Altit at a huge elevated rock. However, a conflict resulted in one of the two brothers settling in Baltit Fort. The brother who remained in Altit Fort was killed hence Baltit Fort became the seat of the Hunza state. For centuries, Baltit Fort remained home of the royal family of Hunza. Not only that, many festivities and important meetings were held inside specially built portions inside the fort. Even today, festivals like Ginani are celebrated in Baltit Fort. Portraits of some of the many Mirs of Hunza who ruled the state of Hunza. Shah Saleem Khan is being escorted for the traditional rituals of Ginani Festival at Baltit Fort. Baltit Fort was abandoned in the mid-1940s. The family of then Mir of Hunza moved to a newly built palace within Karimabad town. For decades, the fort remained a haunted place while it slowly turned into a ruin. During this time, a lot of important items disappeared, a number of which were never recovered. From 1945 until the 1990s, no repair work was done in the fort which posed a threat to a possible collapse of the building. Photos of Baltit Fort taken in 1930’s. The fort was renovated by Aga Khan Cultural Services for Pakistan (AKCSP) and opened for public in September 1996. The restoration work of Baltit Fort took AKCSP about six years to complete with the support of Aga Khan Trust for Culture (AKTC). The fort was inaugurated after restoration by His Highness Prince Karim Aga Khan and then president of Pakistan Mr. Farooq Ahmad Khan Leghari. After the restoration of Baltit Fort in 1996, the fort was opened for public. It is now being managed by the Baltit Heritage Trust. An estimated 15,000 people visit the Baltit Fort every year which includes locals, domestic and foreign visitors. Local elders and leaders of tribes gather in Chataq at Baltit Fort for the celebrations of Ginani Festival. 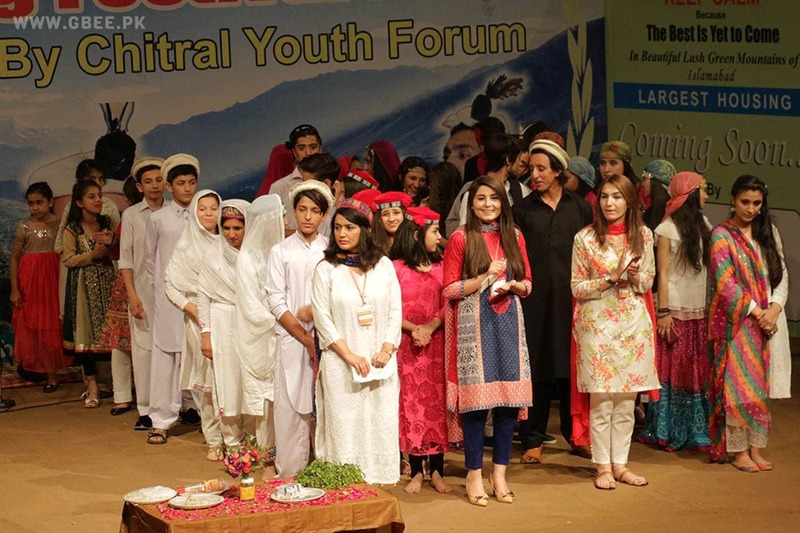 Islamabad: Chitral Youth Forum (CYF) organized Spring Festival to celebrate Nowruz on Sunday, April 16, 2017, at Pakistan National council of Arts (PNCA) in Islamabad. The event was organized to welcome the Persian New Year (Nowruz) in centuries old traditional way. Shezada Iftikhar Uddin, MNA of Chitral, Mr. Sultan Wali, Managing Director of Chitral Associate and Raja Nazeem Ul Amin, the Chairman of Gilgit-Baltistan’s Board of Investment, were among the prominent personalities who attended the event. Over 400 families and professionals from Gilgit-Baltistan and Chitral (GBC), who live in the twin cities of Rawalpindi and Islamabad, attended the event. A main feature of the Spring Festival was how different countries celebrated the arrival of new year and spring as a whole. Young girls and boys dressed in the colorful traditional attire of relevant countries presented skits. Nowruz celebrations and arrival of spring festivities were depicted through popular practices of northern Pakistan, Afghanistan, Tajikistan, Iran, etc. Mr. Shehzada Iftikhar appreciated the efforts of CYF in his address. The famous dance of Chitral, Phastak Dosik, was also presented by young boys. Later on, famous folk singer Jabir Khan Jabir presented one of his latest songs. Popular singers from Chitral like Irfan Ali Taj and Muhsin Hayat Shadab also performed and brought the audience to their feet. A skit on how trends have changed over the years was also performed by Chitrali youth. GB Talent Exploring Society inaugurates the second edition of Gilgit-Baltistan Champions League (GBCL) during Nowruz celebrations hosted at PNCA. GB Talent Exploring Society (GBTES) inaugurates the second edition of Gilgit-Baltistan Champions League (GBCL) during an event hosted at Pakistan National Council of Arts (PNCA) in the Federal capital of Pakistan. The event also marked the celebrations of Nowruz, the Persian New Year that many Shias and Ismailis celebrate across Gilgit-Baltistan and Chitral. The event was attended by youth from all regions without any sectarian or lingual bias and equally participated in the celebrations with great zeal. The event included for the very first time a live theater performance, something this is not quite common among the mountain communities. The Shina-Urdu humorous live theater revolved around the lives of young students who come to cities for their education. It was led and directed by Muhammad Khawar from Gilgit who graduated from Bahria University, Islamabad. The queue sheet was well organized and information sessions were presented from time to time. Various artists from Gilgit-Baltistan performed at the event including Salman Paras, Azeem Hunzai and Iqbal Hussain. The final of GBCL will be played at Jinnah Sports Complex, Islamabad.